On Monday, I went to meet Dr Nipon at the Computational Intelligence Laboratory at University of Chiang Mai. I had made contact with Dr Nipon in Spring 2008 in order to get some technical support during my residency in ComPeung. Dr Nipon prove to be a very nice person and showed much interest in the project. He put me under the safe care of one of his PhD students, Wirot Ponglangka, nicknamed "Joe", who is a specialist in electronics. Joe seems to be very excited about the project as well and is more than happy to help me. 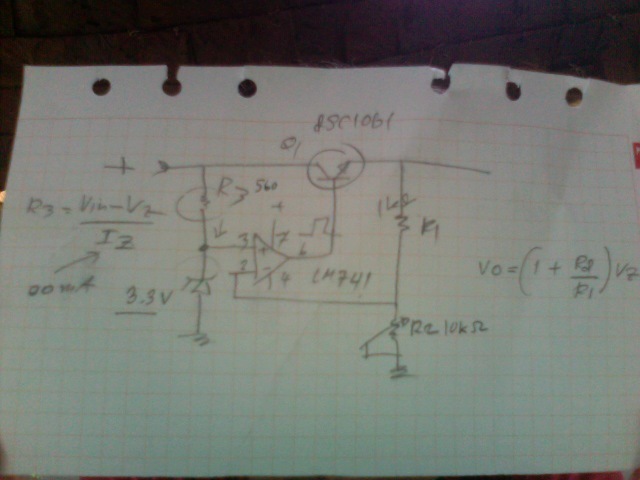 One of the first answers he helped me solve is the following: how to convert DC current to 3V when the input current is more than 3V while letting it pass through when it's less than 3V. The problem I have now with LDO regulators such as TPS7230Q is that whenever the current drops below 3V, the regulator drops to 0V, whereas in fact my ATMega168V chips can run with current as low as 1.8V. 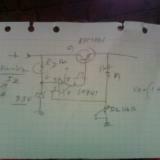 The solution lies in building a circuit using a Zener diode, an op amp (LM741) and a transistor (LSC1061). 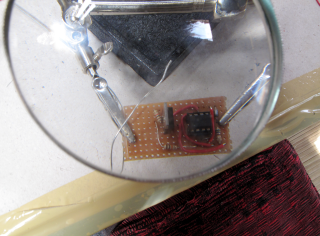 The transistor basically lets the current pass straight from the input whenever it drops below the regulated output. On Monday, I went to meet Dr Nipon at the Computational Intelligence Laboratory at University of Chiang Mai. I had made contact with Dr Nipon in Spring 2008 in order to get some technical support during my residency in ComPeung.Dr Nipon prove to be a very nice person and showed much interest in the project. He put me under the safe care of one of his PhD students, Wirot Ponglangka, nicknamed "Joe", who is a specialist in electronics. Joe seems to be very excited about the project as well and is more than happy to help me.